This post was updated on the 8th of March 2016 to show my new modified sliding hook flyer and to reflect my spinning experience after a few more months with the Electric Eel Wheel. All updates are shown in purple. For a couple of years now I've been looking at buying an electric spinning wheel. I've been spinning on my faithful Ashford Traveller wheel for over 20 years. 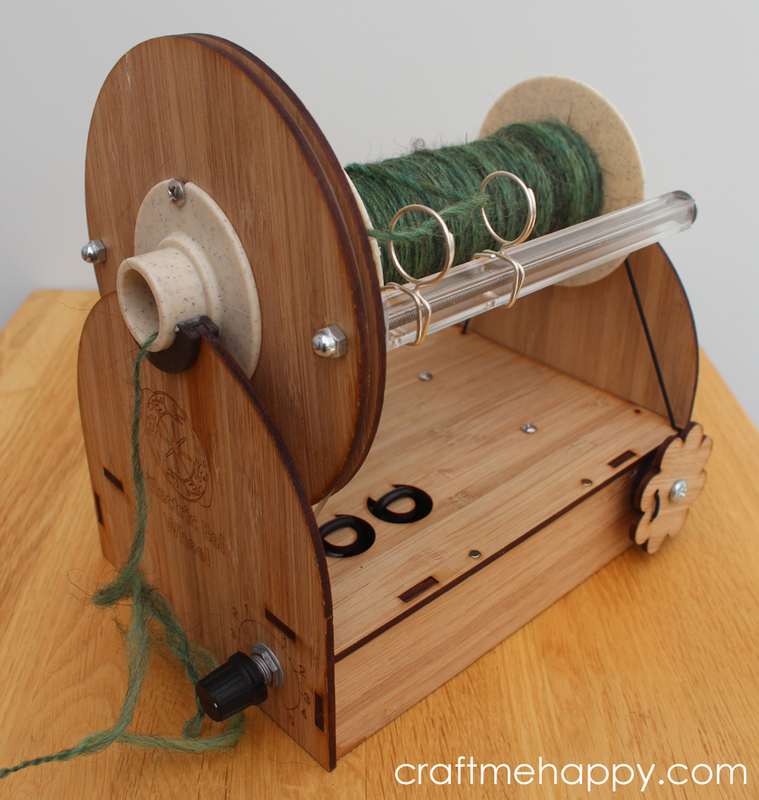 I love my wheel and I find creating and spinning my own yarn extremely relaxing and meditative - or at least I used to... Unfortunately the treadling of the wheel was starting to damage my hip joint, and so over the last year I've had to stop using my beloved Ashford Traveller altogether. The obvious solution was to buy myself an e-spinner. I'll be honest, I've been lusting after the American made Hansen miniSpinner for a while now. It's neat looking, very quiet, comes with a foot pedal and it has the option of a Woollee Winder flyer - which I'm sure I would need eventually. It also comes with a significant price tag. 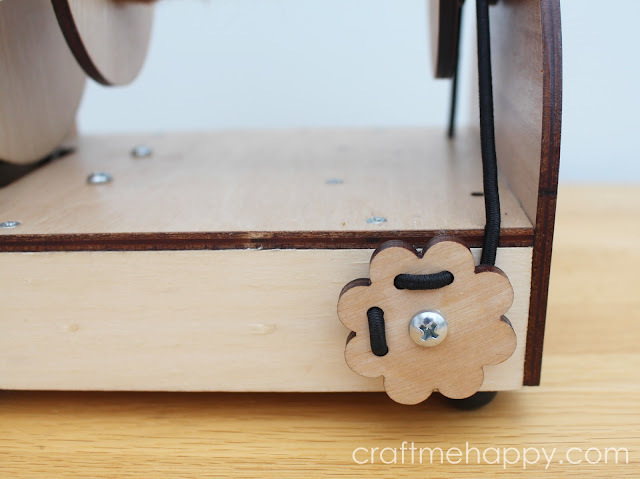 The cheapest wood and flyer option, with three bobbins and shipping to the UK would cost over £620. When you add onto that the £137 I would have to pay in import duty, that's quite a large price to pay for something I'm unable to try before I buy. The only e-spinner that I would actually be able to try before I bought it is the Ashford e-spinner. It is also relatively small, but not nearly as quiet as the Hansen and is priced at a more reasonable £400. Unfortunately, as it doesn't come with a foot pedal, it's not really an option that works for me. I like the idea of being able to spin standing up, sitting down or slightly reclined and the notion of having to lurch forward to turn it off seems quite limiting to me - it's certainly not something I would like to be doing too often anyway. Earlier this year, on one of my many searches for electric spinning wheels, I stumbled across the Kickstarter for the Electric Eel Wheel. I'd actually heard about the Electric Eel Wheel a few years ago and had been very intrigued by it. 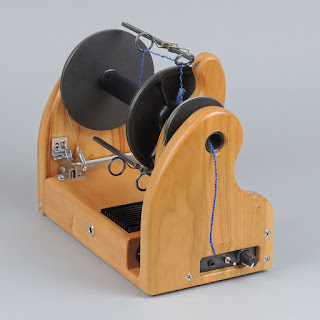 Maurice Ribble, an engineer, designed it for his wife Emily, who loves spinning and knitting. Back then I remember being impressed that he was very generously giving away the cutting files so that others could build their own, and advising people just how to go about it. He'd made his Electric Eel wheel open sourced for anyone to build their own from his design if they are that way inclined. Even now, Maurice provides the files to help technically savvy people build their own Electric Eel Wheel 4 for their own personal use. Unfortunately I just haven't got the skills to build my own electric spinning wheel, so when I stumbled upon the Kickstarter to help fund the 4th version of the EEW I was very excited! Maurice and his wife Emily say that their main motivation in designing the Electric Eel Wheel was to create a highly usable spinning wheel that has been optimised for cost. 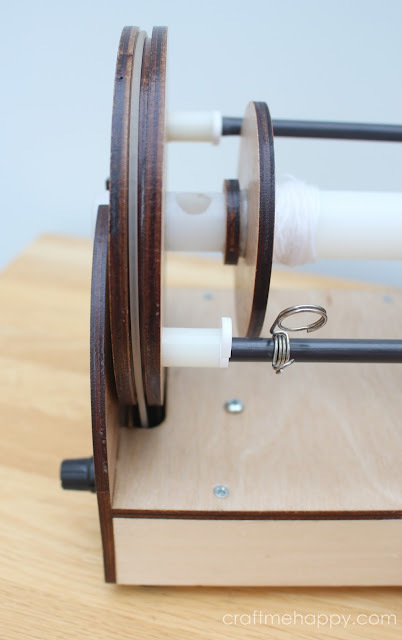 They wanted to make it a quality spinning wheel at an affordable price so that beginners just wanting to try out the hobby for the first time could do so at an affordable price. The Kickstarter price was certainly very attractive. I managed to get an EEW, foot pedal and three bobbins, plus shipping for £164 and the import duty was a much more affordable £34. When I told my husband (who's invested in several Kickstarters in the past) that they were intending to start shipping them in August he said, "Oh, you'll have it by Christmas then." Kickstarter projects are notoriously late, but true to his word, Maurice actually managed to start shipping them in July and the last EEWs reached their destination by the beginning of September. On opening the box, my first impression was how small, delicate looking and light it is! The wheel, flyer and 1 bobbin weigh just over 800g - that's very light compared to the 1.6 kilo Hansen miniSpinner or the 2.8 kilo Ashford e-spinner. It really is a very neat looking wheel and cleverly designed. Considering its pretty low price tag, it's quite attractive too. Unfortunately I couldn't actually use it straight away. I knew that it would come with a US plug and that I would need a travel adaptor, but it wasn't until I pulled it out of the box that it dawned on me that the travel plug that I had was a UK one, not a US one. 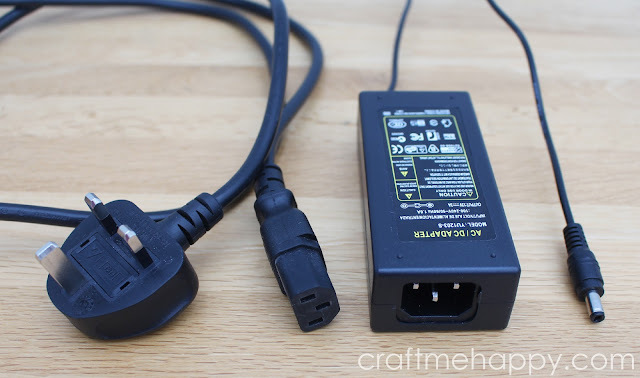 Thankfully my husband is an awful lot more technically minded than I am and so he could see that the plug was connected with an IEC kettle lead - something he had in a drawer at home already. He plugged it in and I was ready to go. Honestly, my first reaction on turning it on was of slight disappointment at how loud it is. I'd watched the Kickstarter video and there was only a slightly perceptible humming noise, so when I started it up, I was a little surprised. If you look at the user manual, the first 2 FAQs are about the noise level, so it must be an issue for some people. There's a Ravelry forum dedicated to the EEW and on reading people's first impressions, some said they thought it was loud, while others were in complete disagreement. It's obviously very subjective and I have to keep reminding myself how little I paid for it. To make it as quiet as the Hansen would have required a much more expensive motor and made the price prohibitive to so many people. One way to demonstrate the sound is to show you the wheel in action, so I've made a little video so that you can hear it. You may notice that I have to raise my voice slightly to be heard - and the camera is closer to me than the wheel. I'd be interested to hear your opinions. To put it into perspective, when I'm right next to the EEW, it's measuring 70 to 75 decibels, which is about as loud as being next to an animated conversation and certainly louder than I like to have my television at home. My daughter has very sensitive hearing and she doesn't like to be in the same room as me while I'm using the Electric Eel Wheel, so that is a real down side for me. Moving onto the actual spinning - it took me 10 minutes or so to find my "sweet spot" for spinning the first time I used it. This was mostly because when I took the wheel out of the box, the Scotch tension had been set quite tight - maybe to keep the flyer secure in transit. It has a covered elastic band for a Scotch tension, which I think is quite unique. (The elastic band is identical to a stretchy hairband I have, so I know what to use if it ever wears out!) I like to spin with very little pull from my Scotch tension, so it took a little while to loosen it enough for me to spin without the yarn pulling away from me too much, but once I'd loosened it enough, I found I was perfectly happy with the elastic band system. 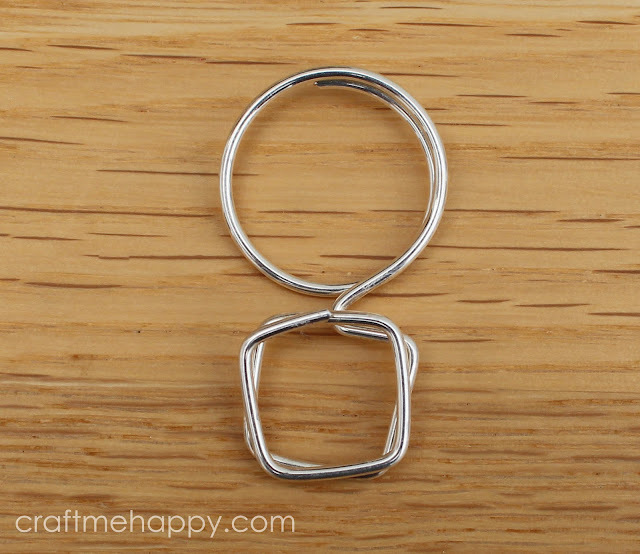 It takes just the tiniest of tweaks to loosen or tighten the band, but it is perfectly and easily adjustable. Some people have had issues with the elastic band scotch tension system as they're finding it a little unresponsive and have swapped the elastic band for something less stretchy. Personally I don't envisage myself having a problem with it. Maurice Ribble ran some stress tests on the Electric Eel Wheel to test its durability. He ran it solidly for 9 days and the only thing that wore out was the Scotch tension band. You can read more about his tests here. The drive belt loops around the large flyer wheel and then around a pulley connected to the motor underneath. The band looks pretty durable and has a nice stretch to it making it fairly easy to replace if it ever wears out. The string drive band on my Ashford Traveller took 20 years to wear out and I'd say that this band looks much more durable, so I don't anticipate this to be a problem. I've always been very worried that I wouldn't get on with an e-spinner, which is one reason that I was so happy to get on the EEW Kickstarter. 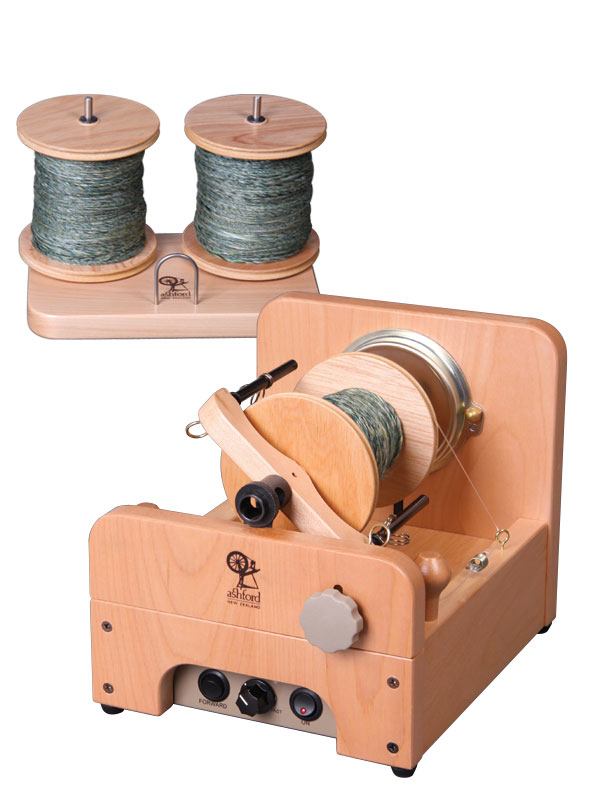 I've read lots of people on spinning forums say how much they miss treadling or that they only use their e-spinners for plying. I wanted this to be my sole machine and I really didn't want to spend several hundred pounds on a wheel, only to find that I struggled with controlling it, or I just didn't find it enjoyable. I'm really pleased to say that I needn't have worried. 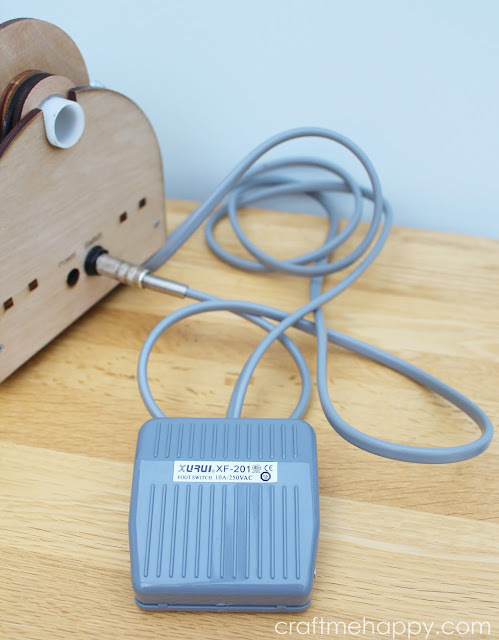 The EEW has a dial that works both as an on and off switch and a direction controller. The central position is off and then you turn it to the right for clock-wise spinning or to the left for anti-clockwise plying. I would say that it's actually more controllable than a traditional treadle spinning wheel as you can start as slowly as you want if you are a beginner, or are just getting to grips with a more difficult fibre, and then turn the dial up for high speed plying. I certainly think that the foot pedal on the Electric Eel Wheel is an absolute necessity and it seems odd that Ashford don't offer this as an option with their e-spinner. 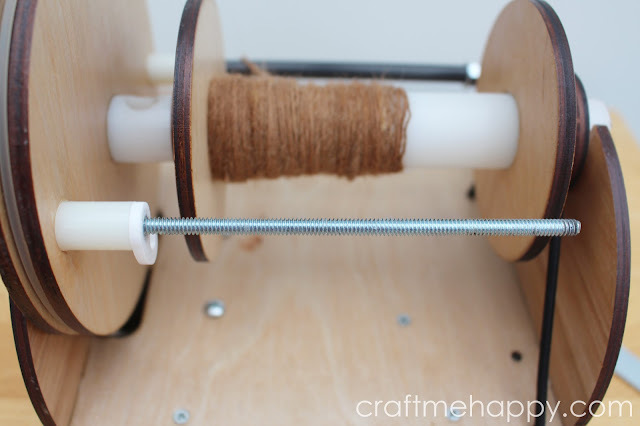 There are obviously the times that you need to stop and reach forward to adjust the position of the yarn on the bobbin, but there are also frequent times when you might just need to pull out vegetable matter from your fibre, or the occasional guard hair that would make the yarn itchier. To be lunging forward and back to switch off the machine every time you needed to fix a fault in the yarn would drive me crazy! I'm happy to say that I've spun with the Electric Eel Wheel sitting in an upright chair, on the sofa, and with my feet up in bed (working the foot pedal with my hand). I've also managed to ply standing up and walking around a little, which for me, (I have a chronic back condition), is a real game changer and highlights how much more freedom a foot pedal gives you. Another reason that I think you really need a foot pedal with the EEW is that the On/Off switch and the direction dial are combined. Once you've found your perfect spot on the dial for putting the ideal amount of twist in, you want to keep it in that position when you want to take a break and for it to be in the same position when you come back to it. One aspect I hadn't considered is the fact that not having to sit right next to the wheel makes long draw spinning much easier too. I've tried it on my Ashford Traveller, but I either have to twist my body in ways that it doesn't want to go, or stretch my arms out, which again, I find very uncomfortable. I'm able to stand with the EEW sitting on a raised table and do long draw spinning by slowly walking away and towards the wheel. It's a joy! The moment that I absolutely fell in love with the Electric Eel Wheel was the day that I found my favourite position for spinning, that I find more comfortable than any spinning position I've tried before. For the last twenty years I've sat upright in a chair and spun with the wheel right in front of me, using a short forward drafting motion; this is how I'm used to spinning, so when I first got my EEW it didn't occur to me to switch things around. It took me a couple of weeks to work out that I could sit, reclined on my bed, with the EEW sitting to the side of me, perpendicular to my thigh, and draft by gently moving my hands apart and together. I can't tell you the RPM of the EEW as this varies from machine to machine and your Scotch tension set up, but I can tell you that it is certainly fast enough for me. I find that I spin at about the 3 o'clock dial position and ply at about 4 o'clock on the dial (and it goes all the way up to 5 o'clock), so I certainly can't envisage a time when I felt it needed more RPM. UPDATED - After 6 months of spinning on my Electric Eel Wheel I've found that my spinning has improved quite a bit. Only having to consider what my hands are doing has meant that I'm now drafting slightly faster and plying considerably faster. I'm now spinning at the 4 o'clock position and plying at full speed. Dare I say, occasionally I'd quite like it to spin at a slightly higher RPM for plying, but it's certainly still fast enough for it not be an issue for me. 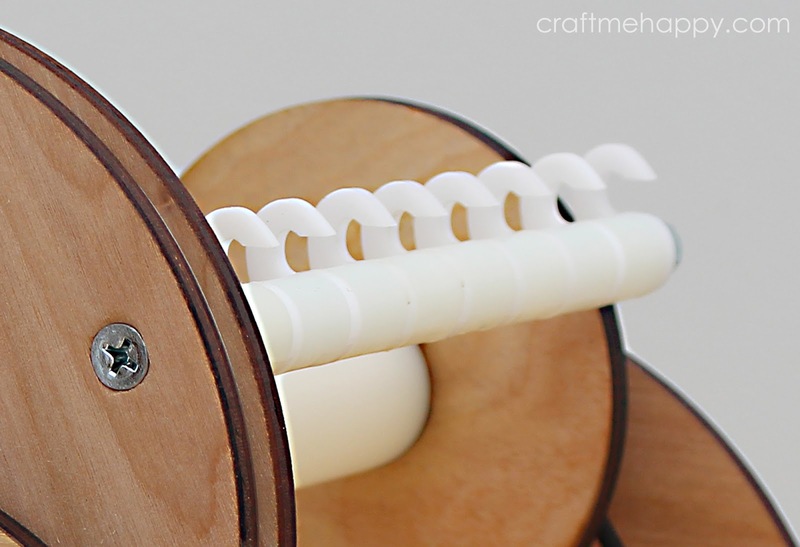 The bobbins that come with the Electric Eel Wheel are quite substantial, if a little basic looking. Maurice Ribble states that they hold up to 170g (6oz) which is a real treat for me. 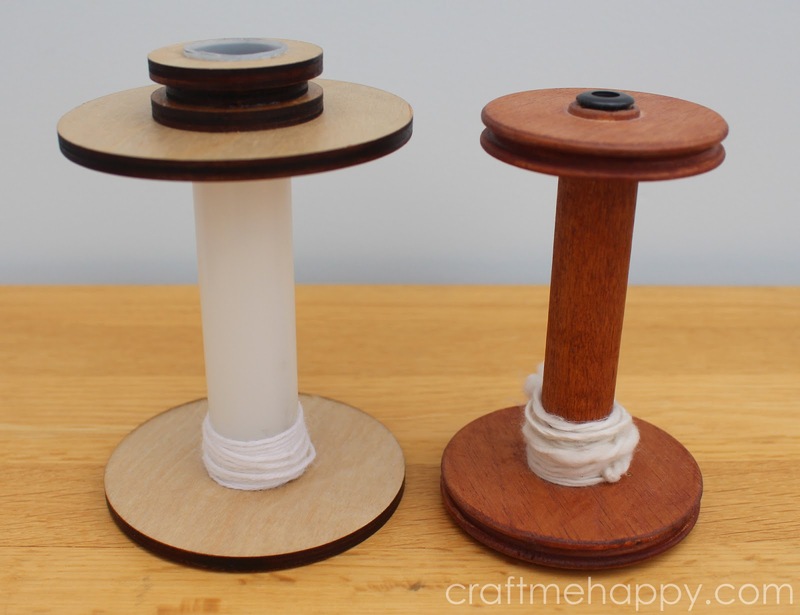 I've photographed the EEW bobbin (on the left) next to a Traditional/Traveller bobbin (on the right) to show just how sizeable the bobbins are. They're certainly quite substantial. I'm used to struggling to get 100g on my small Ashford bobbins, so I'm looking forward to having much longer lengths of yarn without breaks. I must confess, I was intrigued to find out if you really could get 170g on the bobbins, so I spun some Wilton dyed tops until the bobbins was as full as possible and I actually managed to get just shy of 200g of singles on there. 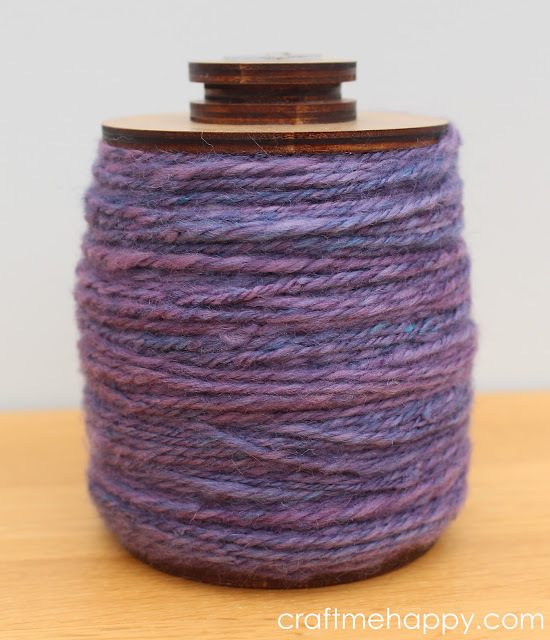 I then Navajo plied the singles and managed to squeeze 175g onto the bobbin. In the past, if the bobbins on my Ashford Traveller were approaching 70g, the wheel would become much harder and painful for me to treadle. With the Electric Eel wheel, all the hard work is done for you and there is no change in performance as the bobbin fills up. 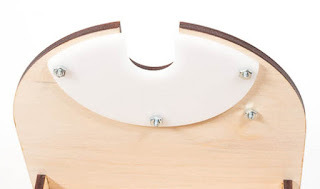 The Electric Eel wheel is constructed mainly from layers of 5.2mm birch veneer and I would highly recommend sanding and varnishing all of the wood before you do much spinning on it. I actually chipped the tiniest splinter of wood off the back section when I was lifting my bobbin off, which made me stop everything and go over all of the upper wood with three thin coats of clear varnish, sanding it back between coats. This seems to have sealed it really well and it's feeling a lot more finished now. Past versions of the Electric Eel wheel have a section of plastic at the front and back for the flyer tube to sit in and I must admit that I'd be much happier if this was still in place as I do worry about damaging the thin 5.2mm wood every time I remove the bobbin. Aside from the volume, my only other disappointment with the Electric Eel Wheel is the plastic hooks. As you can see, they are quite close together and they've been cut from a flat sheet of 3mm acrylic to minimise cost. The points of the hooks are fairly sharp and the edges of the plastic are angular and also quite sharp. When I first started spinning on the EEW I kept having breakages and snags, which I can only put down to my yarn catching on the edges and points of the hooks. I found that if I spun thicker my yarn didn't break so much, but it did still snag on the hooks. Many people on the EEW Ravelry forum had a similar problem and it was undecided as to whether it was down to not putting enough twist in the yarn or whether the hooks were to blame. One lovely thing about the Electric Eel Wheel being open source and economically made is that a lot of the parts can be sourced elsewhere. I decided to see if I could work out my own sliding hook system as the existing hooks just weren't working for me. I unscrewed the nuts at the end of the flyer rods and found that the hooks and spacers were all loosely threaded on to a single bolt. This meant that I could take off all but one spacer and one hook and work out a sliding hook system for the rest of the flyer rod. The tools needed to remove the hooks are a cross-headed screwdriver to insert into the screw on the flyer while you turn the bolt at the end of the flyer rod with a spanner. 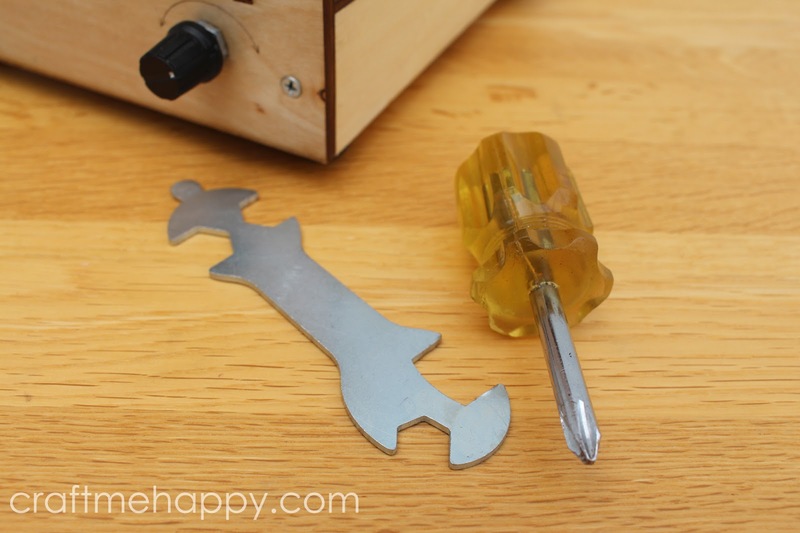 I've actually tried 3 sliding hook systems since this post was first published. The first sliding hook flyer I tried was an adapted Ashford sliding hook which worked OK, but it gripped the sliding hook a little too tightly which meant that changing the position of the sliding hook took quite a bit of force and became a two handed job. I put up with this for a few months before I became frustrated with the effort required to move the hook and decided to try something else. 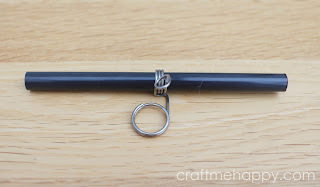 The second sliding hook flyer used the same carbon flyer tube as the first sliding hook, but I made the hook myself from some jewellery wire and a rubber O ring. 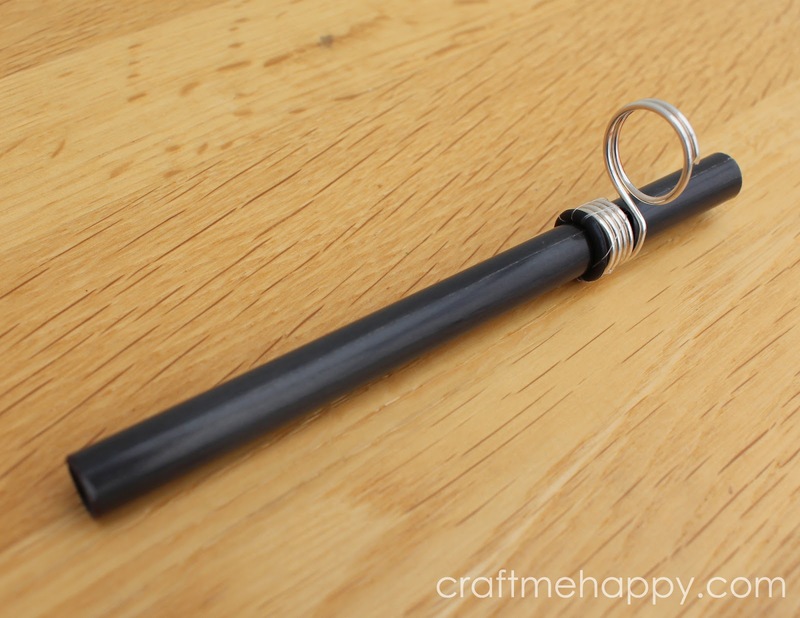 I wrapped my 1mm silver plated wire around a large knitting needle to create a split ring, and then wrapped it around my flyer tube a few times. 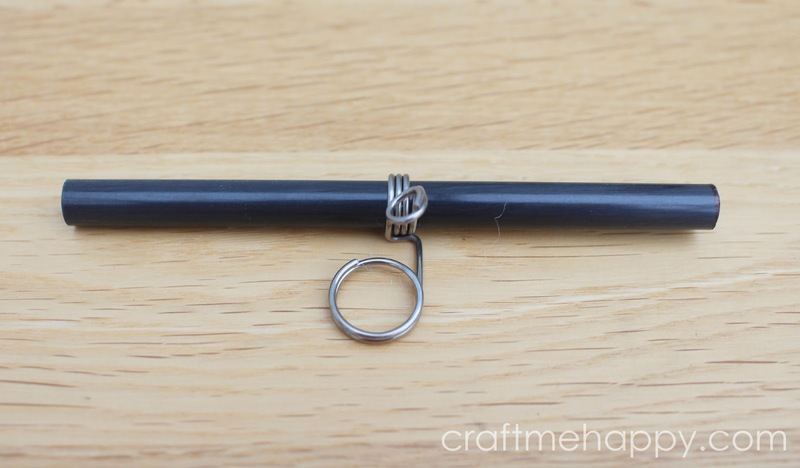 To create grip, I attached an O ring onto the end with some clear thread. This worked infinitely better than the Ashford flyer hook and stayed in position on the rod. The only problem was that as the bobbin got fuller, the ring would slowly slide round towards the bobbin and into the yarn area, meaning that I couldn't fit quite so much on a bobbin. The sliding flyer hook I'm the happiest with, and the one I'm planning on using from now on, also turned out to be the easiest one to make. I decided that as the only flaw with my second sliding flyer hook was that it turned in towards the bobbin, it would make sense to have a flyer bar that wasn't round. 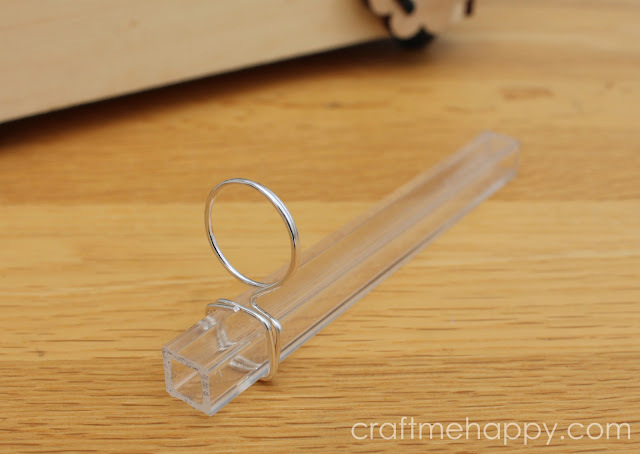 I stumbled upon this clear Perspex tubing on EBay that looked like it would do the job. 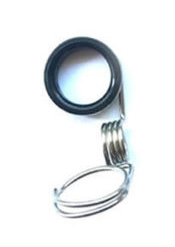 It's got an outer diameter of 10mm and an inner diameter of 6mm. The seller very kindly cut two 11cm lengths for me which fit the bar perfectly. Here's a close up image of my sliding hook. 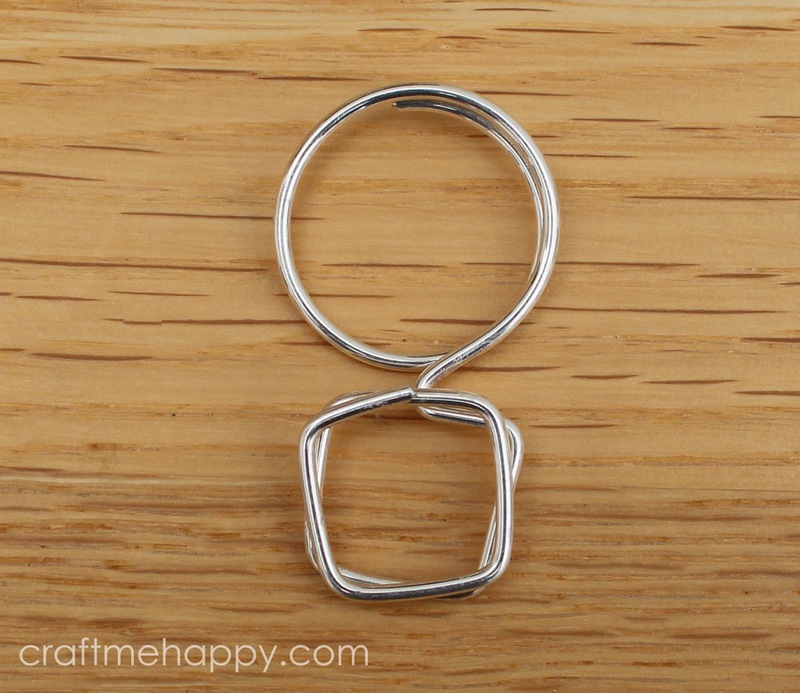 It was so easy to make - I just made a split ring by wrapping my wire around a large knitting needle and then used wire cutters to cut the wire close to the ring, making a split ring that I could slide my yarn in and out of. I used pliers to angle the other end of the wire away from the split ring and then put in a right angle for the first corner. Holding the corner tightly against the Perspex tubing I then wrapped the wire around the square tubing until the wire had done two full circuits of the rod. I was originally intending to use an O ring to stop the hook from sliding up and down the bar, but I later found that this was completely unnecessary. Quite serendipitously, it turned out that as the square loop of wire naturally wants to spring open after it has been wrapped, it grips the bar beautifully and needs just a slight pinch on the side to be moved forwards and backwards. I'm so much happier now with my new sliding hook than I was with the closely spaced plastic hooks and I really like the look of the Perspex compared to all those white plastic hooks. It's also confirmed that it was the hooks that were breaking my singles, as I've not had any unexplained breakages since. As you can see, I've kept one of the original hooks on there as a yarn guide, but I may replace that one for a similar slip ring hook soon. I only say this as I was teaching my friend to spin on the EEW a few weeks ago and the thick, fluffy slubs she was producing kept getting caught on the end of that one remaining original hook. 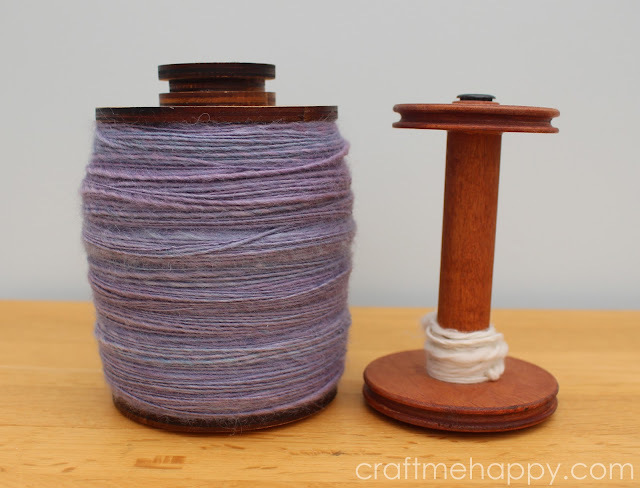 Of course the true test of any spinning wheel is how well and easily it spins yarn. 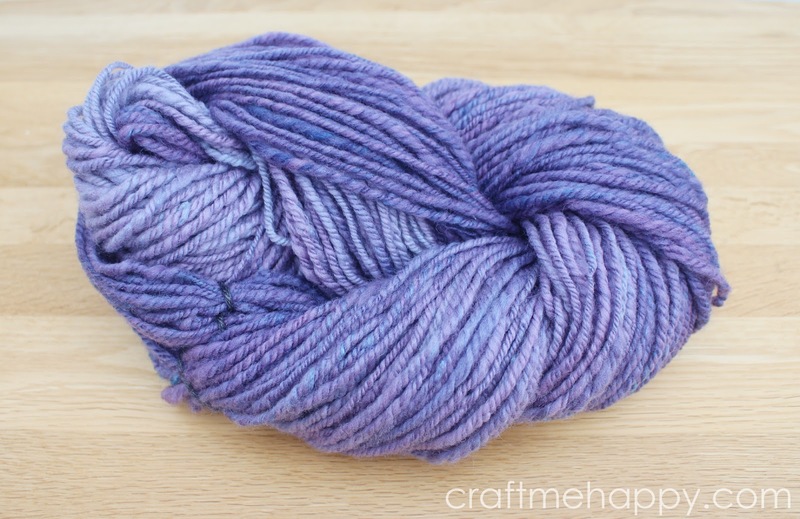 Well here's the 200g of ombré dyed Wilton's Violet yarn I spun, all washed and set. It's a really squishy, bouncy yarn because of all that extra twist to add durability. The Electric Eel Wheel certainly speeds up spinning - I don't think I've spun 200g of Navajo plied aran weight yarn quite so quickly and with such an even distribution of twist. In the past it's been so much effort to put this amount of twist into a yarn, but the Electric Eel Wheel does all the hard work for you while still creating a yarn that is very much hand spun. Yes, there are things that I would and have changed about the EEW, it's not perfect, but it's still a very good machine for the price I paid for it and the more I use it, the more I fall in love with it. 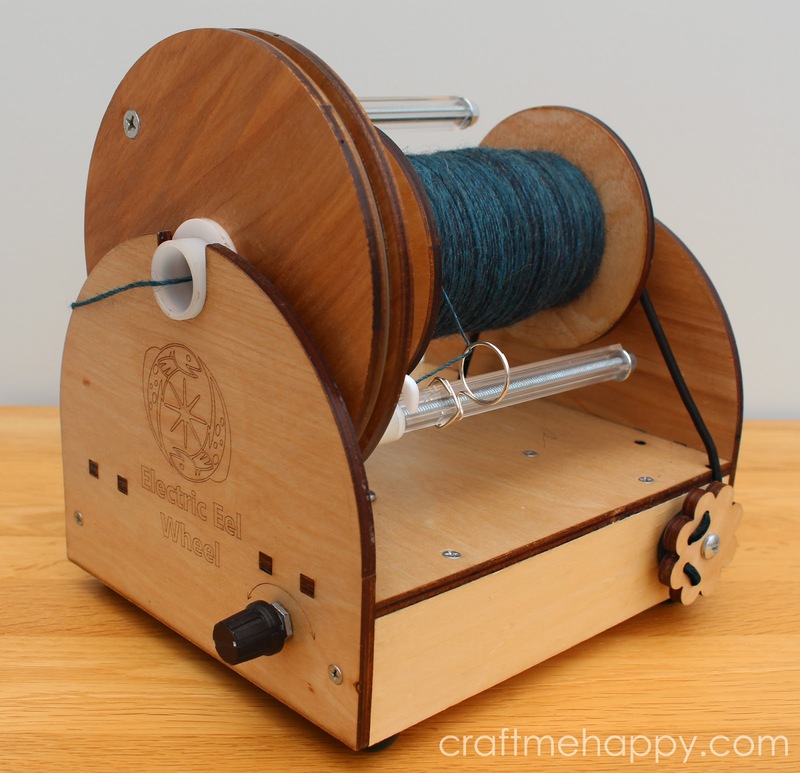 I doubt that anybody that bought into the Electric Eel Wheel Kickstarter was expecting a top of the range machine, but what they did get was a pretty nifty little wheel, that's incredibly portable, (if a little delicate) that can spin a decent yarn along with the best of them. In my opinion, it's one of the best entry level spinning wheels you can buy - treadle or otherwise. I honestly bought my EEW just to see if I liked spinning on an electric spinning wheel and I'm glad to say I'm a convert. After spending a few weeks playing with my Electric Eel Wheel, I've discovered that there's something incredibly freeing about not having to sit right next to the wheel and I really can't see me going back to a treadle wheel now. Thank you so much for reading! I'll be writing soon about the case that I modified for keeping my Electric Eel Wheel in... I promise that post won't be as long as this one! 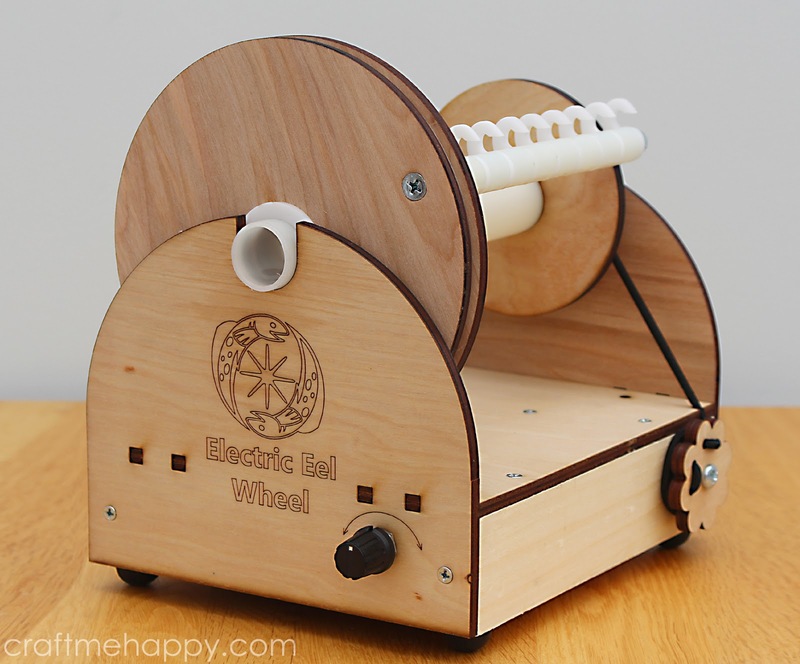 I managed to purchase the new Electric Eel Wheel 5 on the second Kickstarter. I won't be reviewing it just yet as there have been some problems with the yarn wearing down the plastic hooks. Maurice is working on a fix, so it would be unfair of me to review it before he gets this sorted and they go on sale properly. After a lot of experimentation, I managed to get my Perspex flyer fitted to the new Electric Eel Wheel flyer and here it is. It works beautifully and has less friction when moving than the original sliding plastic hook on the Electric Eel Wheel 5. If you'd read this far, you might be interested in my post about the Evolution of the Electric Eel Wheel detailing the current Electric Eel Wheel 5.2 and the new Electric Eel Wheel Mini 2 Nano. Thank you so much for this! I was looking into buying this wheel but was a little hesitant due to the price because cheaper doesn't always mean better. You may want to keep an eye on the EEW Ravelry forum. 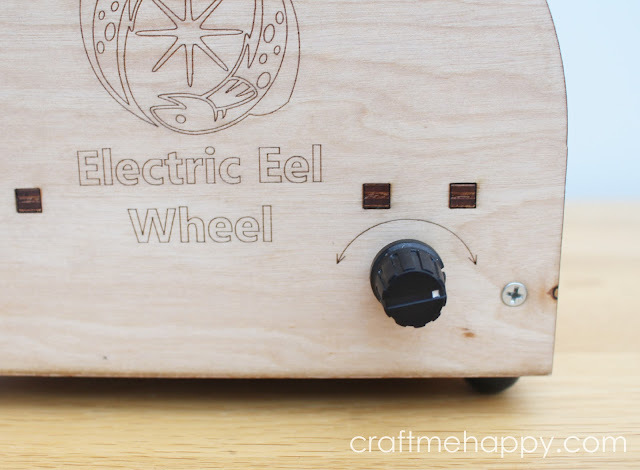 Maurice has listened to all the feedback from the buyers of the current Electric Eel Wheel and may or may not be bringing out a quieter version with some updated features. If he doesn't bring it out, he's looking at ways that current owners can modify their wheels with some kind of upgrade pack. I do hope that I haven't given the impression that I regret my purchase. I still love it and my spinning is improving all the time - it's just not perfect and I wanted to show the whole picture. Very helpful review. Thanks for all the detail. You answered many of my questions. Looks like Maurice and Emily listened, because the new and improved EEW 5 is currently on Kickstarter! The campaign ends 12/15/16 (it has already surpassed its goal 10x), and after my research today I've decided it is the starter wheel for me! Thanks for the great review, it helped solidify my decision. Do you think putting a rubber mat under the spinner would reduce the noise? Would it be possible to sand the edges of the hooks to eliminate breakage? If not would you consider making and selling your hook invention? Hi Susanner, thank you for your comment. Yes, a rubber mat would help to reduce the noise a little. Maurice has posted a video of the new Electric Eel wheel 5 sitting on a silicone pot holder. As the new Electric Eel wheel will be even lighter than this one, the silicone mat should both prevent the wheel from moving and reduce noise a little. Hopefully the video can be found here - https://www.youtube.com/watch?v=v66jvFVy3lM I've also found that the volume is reduced if I spin with the wheel next to me on the bed rather than on a wooden table in front of me. I check it regularly to make sure it's not getting too hot underneath but it's fine. I'm really pleased my review was helpful. Maurice certainly seems to have listened to all of his customers and tried to improve the EE5 for everybody, while still maintaining an attractive price. This is Maurice (I have a really old blogger account under Glacial Wanderer). Thanks for this review. I actually read it for the first time shortly after it was released, and just did a re-read when you linked to this on Raverly. I feel the review is fair. I think we have addressed several of the things you wanted to see improved in our latest version 5 release. I'm constantly working on improving it so if people have any ideas on that let me know. These kinds of reviews are super helpful to me. Thanks!